Where are Ambrosia Apples From? As you may have learned in our video about how Ambrosia apples came to be, this unique apple was naturally created as a result of a chance seedling. There were many things that had to be just right for this to happen. And, one could argue, there was only one place in the world where it could have happened – the Similkameen Valley. 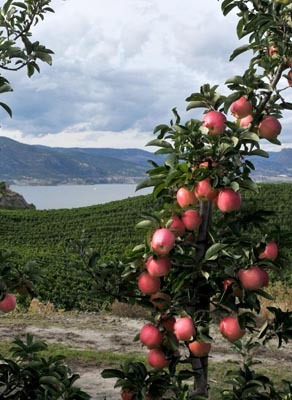 The very first Ambrosia apple tree sprouted up in Sally Mennell’s orchard in Cawston, British Columbia, Canada. Cawston is a small, unincorporated farming community in the southern part of the Similkameen Valley. That might not sound like much of an appealing description, but visitors marvel at the picturesque mountains and the lush valley filled with orchards and vineyards. The town started out as an expansive cattle ranch but word soon got out that the ground was extremely fertile and the gentle wind down the valley helped keep pests under control. 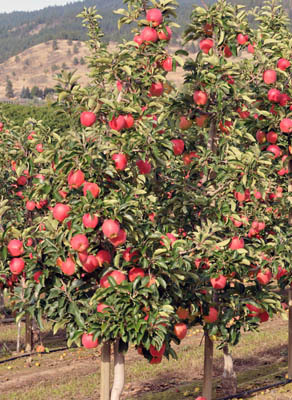 In addition, the hot sunny days and cool evenings made the weather ideal for growing fruit. Farmers flocked to set up orchards and small farms. Vineyards have recently joined the agricultural mix. A visit to Cawston usually includes a stop at a farm-gate market (right on the farm), or a local fruit stand and a wine tasting or two at one of the local wineries. We think the best time to visit is September when the Ambrosia are in the final stages of ripening on the tree. There is nothing quite like wandering through the orchard on a sunny September day with big, beautiful Ambrosia apples hanging off the trees. If you want to enjoy an extended stay in the Similkameen Valley there’s plenty to keep you busy. Cycle the long and winding farm roads. Get a better view by hiking one of the mountain trails. Drop a canoe or a fishing line into the Similkameen river. Tee up a golf game. Strike up a conversation with a local. Or, laze the afternoon away at a riverside park enjoying a picnic featuring locally produced artisan breads, jams, cheese and meats, and some just-picked Ambrosia apples. You could also travel a few kilometres north and visit the neighbouring community, Keremeos. It’s easy to spend a weekend or a week taking in the charm and verdant beauty of the birthplace of Ambrosia apples.